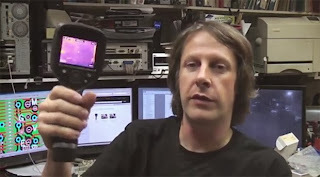 The Backwoods Engineer: $995 Thermal Imaging Camera - 'Upgraded' to 320x240 by a Firmware Hack! Okay, you've always wanted a thermal night-vision camera, right? But them things is spendy. And the cheesy FLIR E4, with its junky 80x40 resolution does not inspire you, right? Mike, our hacker hero, with an "upgraded" E4! 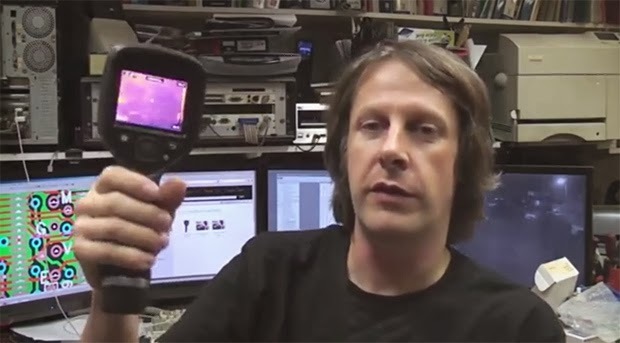 Well, via our friends at Hackaday, Ol' Backwoods has learned of a firmware hack done by a fellow from the UK called Mike, that turns the $995 FLIR E4 into the $5,995FLIR E8 with 320x240 resolution! And the upgrade can be accomplished in just a few minutes with the program in this zipfile. The reason this hack works is that the E4 and E8 share a common hardware architecture. Ol' Backwoods suspects they save money by not testing every single E4 to the 320x240 resolution. Testing costs a LOT of money, because it's labor, but CMOS far-infrared sensor arrays? Cheap. Here's how you do the "upgrade". At the end of the file, replace xxxxxxxx with the 8-digit serial number of your camera. If anyone does this, I'd like to hear about it in the comments. Ol' Backwoods would love to have one, but with this Noo Yawk trip coming up, I ain't got the silver to drop on it. anyone know if the hack is still working on newly purchased units? hate to get one and not be able to upgrade. It works!! My E4 runs faster with new features. Thank you so much! I cant stop showing off my camera now. Thank you!!! Any way to get around with the firmware because anything that I find its with the 2.0 firmware. Any way around this? Does this work on a e5 with firmware 1.19.8?